Mary’s career as a versatile performer has taken her all over the world, and allowed her to work with some of the most interesting and acclaimed artists and musicians working today. 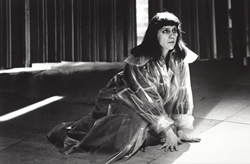 Although she began her career expecting to concentrate her activities in the mainstream world of operatic performance, a chance encounter with Schoenberg’s groundbreaking work Pierrot Lunaire as a student at the Guildhall School of Music and Drama led to an obsession with the piece and a fascination with how composers have developed the expressive qualities of the voice. Forging working relationships with many composers, she became a champion for a host of new writing for the voice. Her first professional performance was as a singer for Ballet Rambert, performing George Crumb’s Ancient Voices of Children. 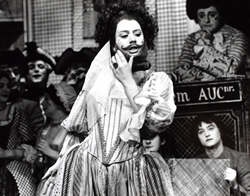 She continued to sing for them in many performances of Pierrot Lunaire with Glen Tetley’s iconic choreography. 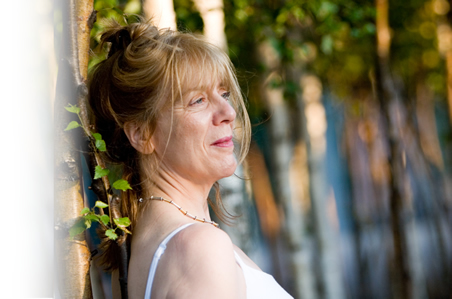 Since then, Mary has made a particular speciality of performing the work of contemporary composers, including Luciano Berio, Sir Harrison Birtwistle, Philip Cashian, George Crumb, Michael Finnissy, Jonathan Harvey, Hans Werner Henze, Oliver Knussen, Nicola LeFanu, György Ligeti, Tod Machover, Peter Maxwell Davies and Judith Weir. She has given the first performances of a number of new operas including Finnissy’s The Undivine Comedy, LeFanu’s Blood Wedding, Andrew Toovey’s The Juniper Tree and Kopernikus by Claude Vivier. She has also performed some of the 20th century’s most demanding chamber orchestral concert repertoire, including Henze’s Voices and Ligeti’s Aventures and Nouvelles Aventures. Her creative relationships with Oliver Knussen and Sir Simon Rattle have spanned her career. 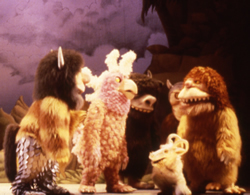 She created the roles of ‘Mama’ and ‘Tzippy’ for the premiere of Knussen’s Where the Wild Things Are at Glyndebourne and has subsequently performed them again in revival and on film and disc. With Simon Rattle, she has performed The Seven Deadly Sins (Kurt Weill), Beethoven 9, Birtwistle's Meridian and Ravel's L'Enfant et les Sortilèges as well as making her Royal Opera House debut with him in the award-winning production of The Cunning Little Vixen. Mary's other operatic roles include Marcellina (Le Nozze di Figaro), Baba the Turk (The Rake's Progress), Mrs Grose (The Turn of the Screw), Florence Pike (Albert Herring), Dorabella (Così fan Tutte) and Meg Page (Falstaff). 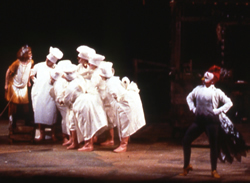 Mary’s versatility as a singing actress has led to appearances on the music theatre stage. She has taken part in a number of Pimlico Opera’s acclaimed musical theatre productions based in UK prisons, performing the roles of Mrs Peachum (The Threepenny Opera), Mrs Lovett (Sweeney Todd) and Miss Adelaide in Guys and Dolls (the latter the subject of a BBC documentary). 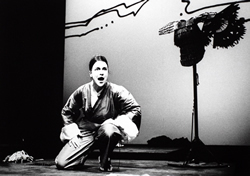 She appeared as Ruth in Leonard Bernstein’s Wonderful Town for Grange Park Opera, and she also took part in the premiere of Caryl Churchill’s innovative theatre work The Skriker at the National Theatre. As a recitalist, Mary and her regular accompanists Andrew Ball and Catherine Edwards have made many recordings for BBC Radio 3 in repertoire ranging from Borodin to Eisler and Ives. "The wonderfully articulate and versatile Mary King"
"Mary King's immaculately sung performance"
"Mary King (was) the formidable alto, traversing a vast range of personae from cabaret diseuse to iconic diva"
"that wonderful singing actress Mary King"
"a considerable feat of acting"
"Mary King dug deep into the music's expressive heart"